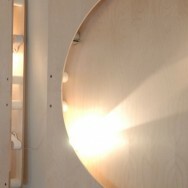 Jake Dyson produced a new product titled the Motor Light Wall. Considering the unique quality of the product, we were intrigued and interested in collaborating on producing an installation with a number of these fixtures fully controlled and synchronized during their exhibition. 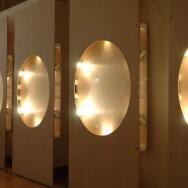 The resulting installation was titled Focal Shift and during 2009 was exhibited at the Bruno Rainaldi gallery during the Milan Salone di Mobile, at the Pomegranate gallery during the ICFF in New York, and finally in Earls Court during 100% Design in London. 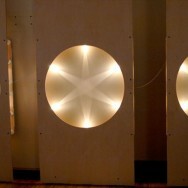 Each panel had 6 of the Motor Light Wall’s installed at equal distances to one another. I programmed 20 different animation sequences which would happen in unison, and then 6 that used all the panels as a canvas. 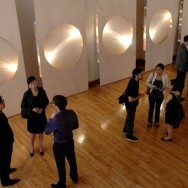 The intention was to demonstrate the potential that these fixtures offer. 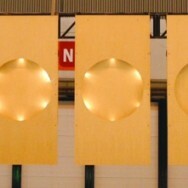 The light would in effect be carved by the position of the motorized aluminium fins. The brightness of the lamp could be controlled which added the potential of subtle shifts in the personality of the installation. 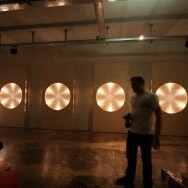 During the course of this project, we helped Jake Dyson’s studio make the Motor Light Wall into a DMX controllable device. This project was produced while I was at Jason Bruges Studio for Jake Dyson’s studio. 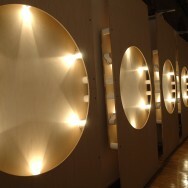 The panels were designed by Tom Sloan.